If you’re thinking of heading Down Under, either on a working holiday visa or a shorter trip, you’re probably wondering what the cost of backpacking Australia really is. As you’ll know if you follow my blog, I’ve travelled Australia multiple times, using many different forms of transport and accommodation. I now live in Sydney long term as a permanent resident. Over the last few years, I’ve driven and camped in a tent all the way from Perth to Brisbane via Adelaide, Melbourne, Tasmania and Sydney, as well as staying in either hostels, Airbnbs or house sits in the major cities. Since I mostly travelled with one other person, I kept track of all our costs on the road so we could split them fairly. 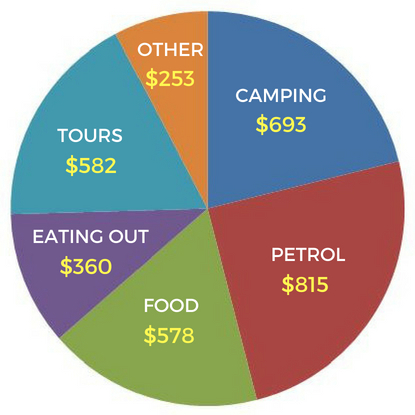 So luckily for you, I’m able to share the average cost of backpacking Australia based on my actual road trip expenditure! Obviously your budget is going to vary from mine depending on how long you travel for, what sort of food you eat, if you want to party a lot and how many tours you take. But this backpacking Australia budget should give you a good idea of what to expect. For those of you on a working holiday in Australia, you’ll have an advantage over short-term travellers, as you’ll be earning Aussie dollars rather than just exchanging your home currency. While it’s true that Australia is quite an expensive country compared to places like Southeast Asia and even the UK, wages tend to be higher over here which makes up for the difference. The legal minimum wage in Australia from 1 July 2018 is $18.93 per hour (approximately £10.85), compared to £7.38 in the UK if you’re between 21-24, and only £5.90 if you’re 18-20! Even shelf stacking in a supermarket can earn you over $20 per hour. So if you’re planning on taking a working holiday in Australia, you should be able to earn enough to support yourself and fund your travels. 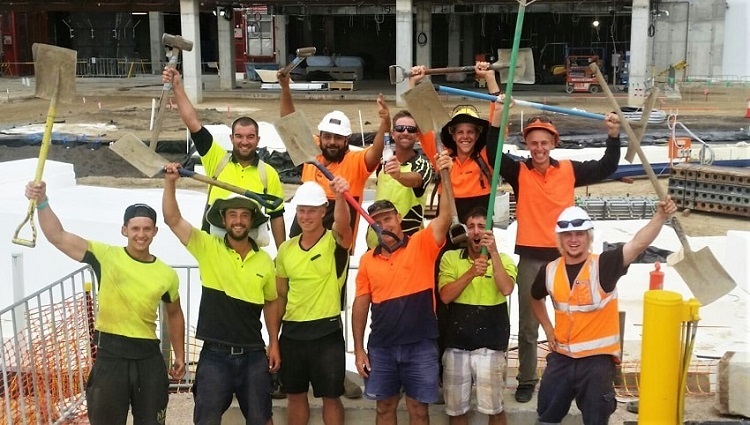 Backpackers working in construction in Perth and saving for those road trips! You’re obviously going to encounter some costs just to get to Australia. Your flights are going to vary depending on which country you leave from, which airline you use and whether you’ve booked a single, return or round-the-world ticket. I usually start off with SkyScanner to compare flight prices. Travel insurance will also vary depending on your level of cover, whether you’re on a short holiday or long backpacking trip to multiple countries, and whether you want to add on certain activities. A Working Holiday visa is going to cost you more than an ETA visa (three-month tourist visa). 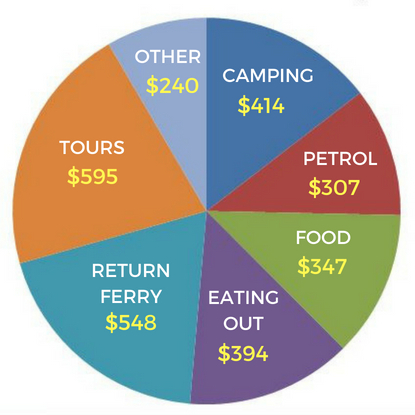 Here are some approximate costs of travelling to Australia. 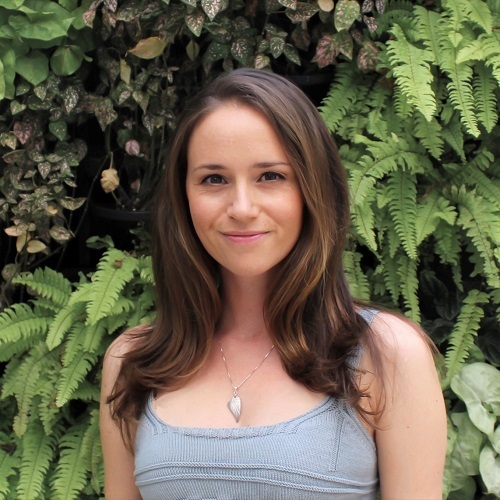 Working Holiday Visa Australia: Cost, Age Limit & Why You Should Go for It! Accommodation is going to be one of your biggest costs of backpacking Australia. While hostels are a popular choice, don’t assume they’re your only option. 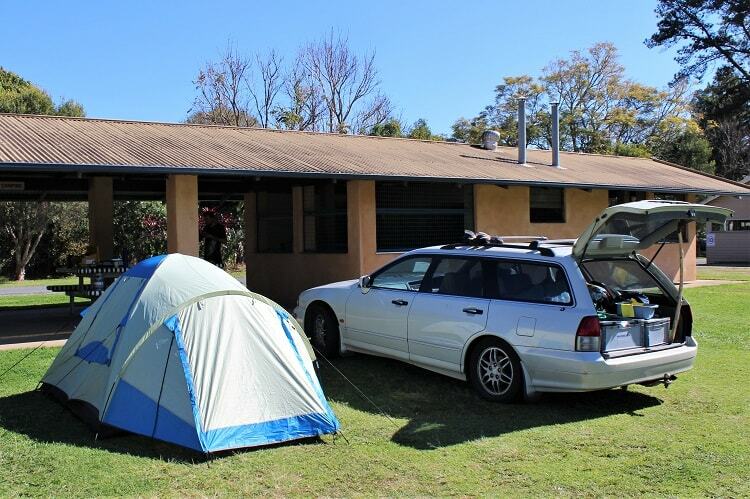 During our road trips we drove a car I bought in Perth and camped in a tent at either caravan parks (which had proper bathrooms, kitchens and power sockets) or cheaper, more basic bush camps and national parks (which usually just had compost toilets). Note that the bush camps and national parks I stayed at were mostly remote ones in WA that cost us nothing. In NSW and Victoria they can be much busier though, particularly around Sydney and Melbourne, and cost up to $35 per tent. In the cities I usually stay in hostels if I’m by myself, but travelling as a pair we tended to use Airbnb, which actually worked out cheaper than hostel dorms in Melbourne. I also discovered house sitting when I lived in Perth, and we managed to do it for two weeks over Christmas in Adelaide and for a few days in Melbourne. I also house sit long term in Sydney now. Here is the average cost of accommodation in Australia based on my trips, but remember prices can vary a lot. I stayed in hostels in Perth, Melbourne, Sydney and Brisbane, but I’ve heard they’re cheaper in north Queensland and up the west coast. 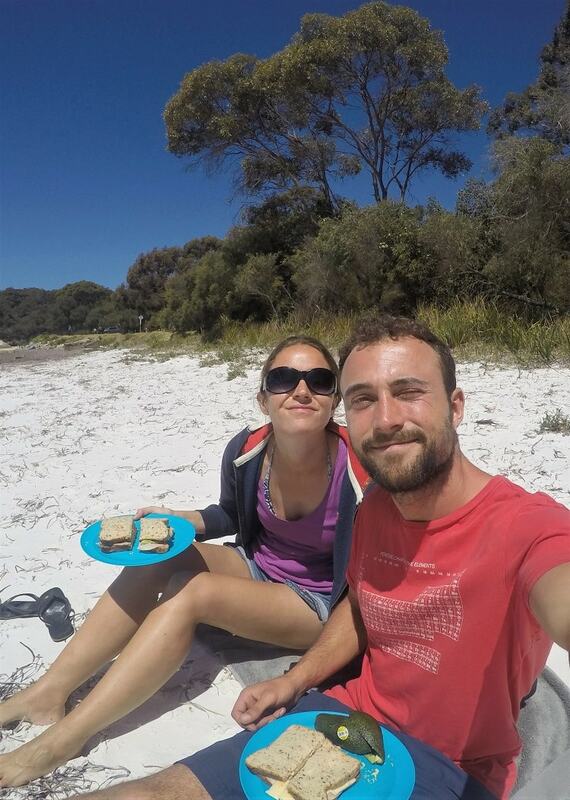 Most backpackers in Australia cook their own meals at hostels or campsites to save money. The average food cost per person during my road trips came to just under $10 per day. However, my travel mate, Michi, did a lot of exercise and ate quite large portions. I also ate quite large portions due to food envy (for example, four sandwich fillings instead of one), which resulted in a weight gain of 4kg! Meanwhile Michi, who regularly complained that sandwiches with four fillings were not enough to constitute a meal, lost so much weight he ran out of holes in his belt. Hhhmph! To give you an idea of what $10 a day can get you, we were both meat eaters back then, and ate three solid meals a day (in my opinion) plus snacks of either fruit or rice cakes with peanut butter. We went for the cheaper options where possible (home brand tinned tomatoes etc), but ate a lot of nuts and vegetables, as well as brown rice and wholemeal bread instead of the cheap white stuff. 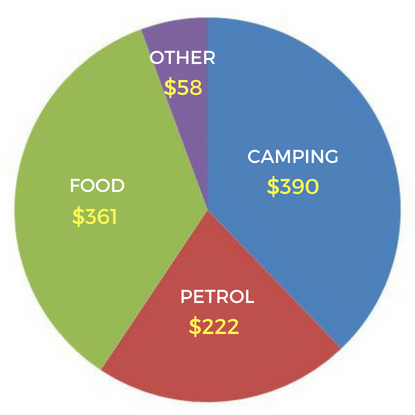 You can definitely spend less on food in Australia than we did, but way more if you buy a lot of fast food and snacks. As an example of takeaway food, fish and chips costs about $12. For a cheaper meal, Dominos sell value pizzas starting at $5; they even do gluten free! You can expect to pay between $18 and $26 for a main meal in a standard high street restaurant, or about $8-$16 for breakfast food, depending how fancy the café is. Drinking alcohol can really bump up your budget in Australia. Backpackers seem to drink way less now than when I first travelled Oz over ten years ago and the dollar was weaker. Goon is the cheap, backpacker drink of choice. It’s four litres of wine of a questionable standard inside a foil bag in a box with a tap on the side. I still remember the pungent smell, acrid taste and near-death hangovers from my student days here. I couldn’t touch it again if you paid me. Here are some prices from the BWS (Beer, Wine & Spirits) website, a popular chain of off licenses in Australia (or bottle shops, as they call them here)! And here are a few typical prices of drinks in bars. You’ll find cheaper offers in backpacker bars though, and higher prices in swankier city bars. If you want to buy a car in Australia so that you can travel at your own pace like I did, you can easily buy one complete with camping gear from other backpackers who have finished their trip. Just get a mechanic to check it over first as they are usually very old and not always looked after well unfortunately. Alternatively, look for private sellers on Gumtree or in local newspapers, or go to a car dealership. You’ll want something like a station wagon (one with a very long boot) to fit all your camping gear and luggage in. Or for more money you could buy a campervan or a 4WD. You’ll also have to pay car registration fees (rego), which is equivalent to car tax in the UK. I bought comprehensive insurance too; yours could be more expensive if you’re under 25 though. And of course the car will need servicing and possibly repairs. Note that mechanics charge about $100 per hour for labour in Australia, and that’s on top of the cost for any replacement parts you need. Owning a car can be a pricey business! Repairs & replacement parts: $$$ limitless! If you don’t want to go on a self-driven road trip in Australia, you could opt for a bus tour, or just standard coach travel. I did the Oz Experience bus when I first went backpacking in Australia as a student, which offers flexible hop-on, hop-off bus travel with Greyhound Australia (the equivalent of National Express in the UK), and different packages depending on whether you want to include food and accommodation. You can also book a hop-on, hop-off pass directly with Greyhound Australia, with or without accommodation packages. These aren’t the only bus companies in Australia, but here is a sample of prices to give you an idea. It’s also worth looking into train fares, particularly if you just want to get from one city to another. I got the train from Sydney to Canberra recently (about a four-hour journey), and it only cost $21! Additional extras like boat trips, tours and activities can add quite a lot to the cost of backpacking Australia. 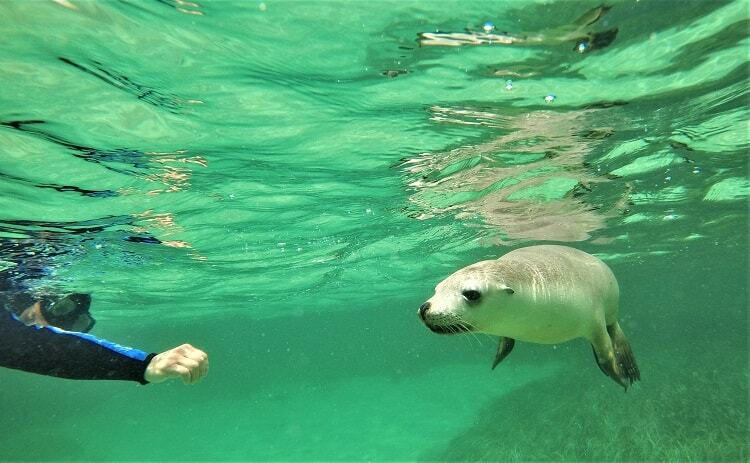 For example, an afternoon swimming with dolphins and sea lions in Baird Bay, South Australia cost me $150. You might want to go diving, snorkelling, visiting historical sites or jumping out of planes! So make sure you add some extra allowance on for these when you’re budgeting. 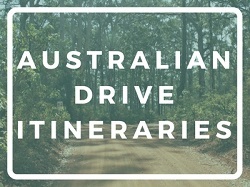 I’ve listed the prices of all the tours I went on in each section of my Australia road trip cost breakdown below, but here are some examples of popular trips and typical costs. 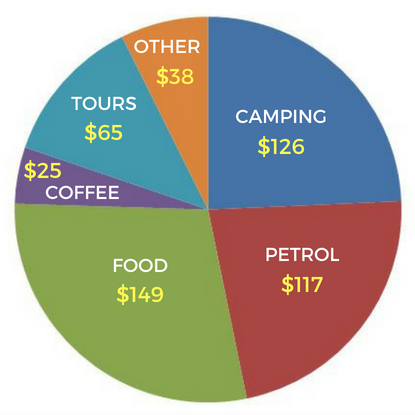 Here’s a breakdown of my Australian road trip costs for each section of the journey. It covers all the shared costs between two of us, but excludes any personal items like toiletries, clothes, cigarettes and alcohol. It also excludes the cost of buying and maintaining my car, buying camping equipment at the start and the cost of staying in the cities at either end of each section. These are just the costs of time on the road. The “Other” element mainly covers things like laundry, cinema, parking in city centres and replacing a few camping bits. On this road trip two of us drove my car and camped in a tent. We had 21 nights in caravan parks, ten nights bush/national park camping and one night in an Airbnb (due to a tent/storm debacle)! We also went on the following tours: Busselton Underwater Observatory ($32pp), whale watching tour Dunsborough ($80pp), Walpole Wilderness Treetop Walk ($19pp), Baird Bay sea lion swim ($150pp). 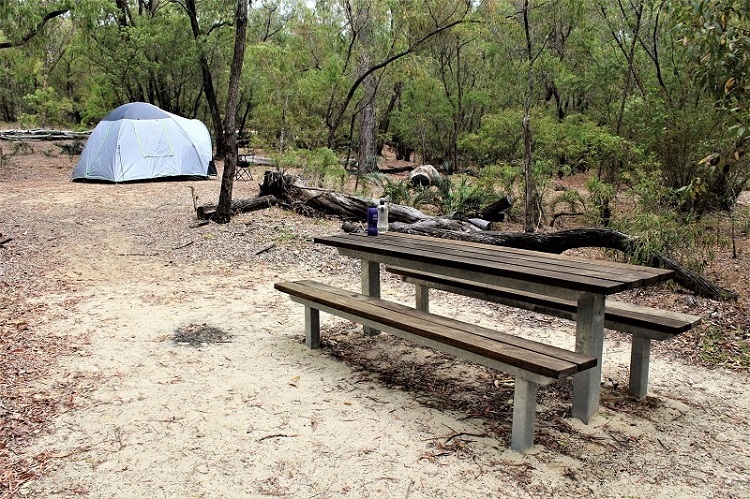 We continued tent camping on this shorter trip, and spent four nights at caravan parks and one night in a national park. We also went on these tours: Murray River Paddle Boat ($19pp), Tantanoola Caves ($13pp). Our Tasmania road trip involved 17 nights at caravan parks and 4 nights in national parks. A big cost was the return ferry from Melbourne, as it’s a long journey (around ten hours) and expensive to take a car over with you. We spent more on eating out and entertainment than usual, as we had a few days of torrential rain in Hobart and couldn’t do much other than hang around the city! We also went on quite a few tours and ferries: Port Arthur ($37pp), Gordon River cruise ($105pp), West Coast Wilderness steam train ($99pp), ferry to Bruny Island ($17), ferry across Lake St Clair ($40pp). 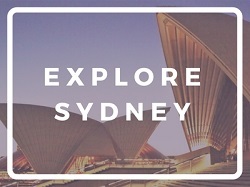 I did this trip by myself, as I’d just returned from a long visit back to the UK and wanted to get straight to Sydney after picking up my car in Melbourne. It was winter, and about 2 degrees at night! So rather than camp I spent five nights in hostels and 2 nights in cheap motels/cabins when there was no hostel in the area. The only tour was the Phillip Island Penguin Parade, and I’ve made a guess at my food spend as I didn’t write it down! This trip was between two of us again. It took three weeks, as we spent four nights camping at the Arts Factory in Byron Bay and three nights staying for free with a family we knew in Newcastle. We also had two nights at bush camps and the remaining 11 nights at caravan parks. It’s very hard to calculate a daily budget for backpacking Australia, as there are so many factors that will affect what you spend. 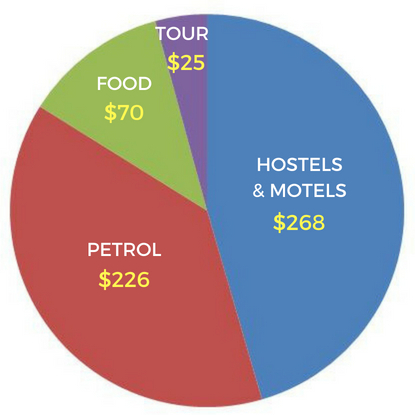 If you’re mainly staying in hostels, I’d budget $28 per night for accommodation, and $10 per day for food. So $38 per day as a base rate. Increasing that to $60 per day would be more realistic, and allow things like an Australian sim card, public transport in cities, snacks, coffees, a meal out or cinema trip at the weekend and maybe a few drinks. You then need to add on the transport cost of any road trips or internal flights you may take, plus tours and excursions. And of course the cost of your visa, travel insurance and flights. To plan your working holiday in Australia, make sure you read my comprehensive guide below. It runs through all the tasks you need to complete before and after your trip, such as opening a bank account and choosing a mobile phone provider. 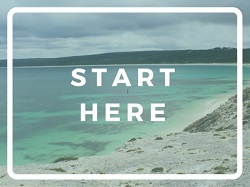 Working Holiday Australia Guide: Plan Your Epic Year! 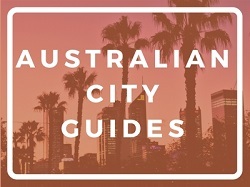 I hope this backpacking Australia cost guide has given you a better idea of what a trip Down Under would set you back. It is an expensive country, but well worth visiting for the amazing scenery and weather. But be warned, you may never want to leave!